The term synopsis refers to a piece of work that is a summarization of a larger piece of work. A synopsis can be written in the form of tables and charts, as prose, as an abridgment or even as a consolidated re-write of the original work. A synopsis is often written but can also take verbal or visual form. An individual can give a shortened verbal account of an event or written work and that would be a synopsis. Additionally, production of a video synopsis exists as well, in which a longer piece of work is summarized in a shorter video. A synopsis of Romeo and Juliet might read: Two people from warring families meet, fall in love, and then kill themselves. A synopsis of Les Miserables might read: A man is arrested for stealing a loaf of bread. He spends 20 years in jail, gets out and remakes himself as a new man and the mayor of a town. He rescues the child of a poor woman and raises her. A police detective cannot see that he is changed and haunts the man, but when they encounter each other during the French Revolution, the former thief lets the detective go with his life. A synopsis of the Sopranos TV show might read: A mob boss sees a psychiatrist and discusses work and family problems. A synopsis of the TV show Seinfeld might read: It was a show about four friends who lived their lives in New York City. A synopsis of the TV show Friends might read: It was a show about six young New Yorkers living together in an apartment house, with several of the friends eventually falling in love and getting married. 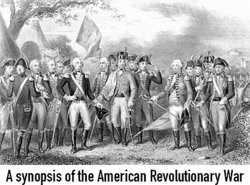 A synopsis of the story about the revolutionary war in the U.S. might read: The colonists were angered by Britain taxing them without representation and thus declared and fought for independence. A synopsis of The Sound of Music might read: A nun leaves a convent to be a nanny for a family with a single father and seven children, falls in love with the father and leaves the country with them to escape the Nazis. A synopsis of the Lion King might read: A baby lion is born to be King but his cruel uncle kills his father and sends the baby away. The baby lion returns to fight his uncle and take his rightful place. A synopsis of Cinderella might read: A woman has cruel step sisters and a cruel step mother. A fairy godmother visits her and dresses her up so she can go to the ball and the prince falls in love with her. A synopsis of The Little Mermaid might read: A mermaid falls in love with a man and tries desperately to become human so that the man will fall in love with her as well. After giving her voice to a sea witch, she is eventually able to triumph and become human so she can live happily ever after with the man she loves. Now you have seen lots of different examples of works which have had shorter versions performed or synopses written. "Synopsis Examples." YourDictionary, n.d. Web. 18 April 2019. <https://examples.yourdictionary.com/synopsis-examples.html>.